It’s been more than 25 years since the last time we saw a team of Ghostbusters grace the big screen – and a great deal of that time was spent watching the franchise’s next installment battle its way out of development hell. The wait is now almost over, however, and nothing spells that out quite like an exciting debut trailer! Badass jumpsuits? Check. Wicked-looking proton packs? Absolutely. Ecto-1? Nice and shiny. Slimer? Surprisingly, yes! 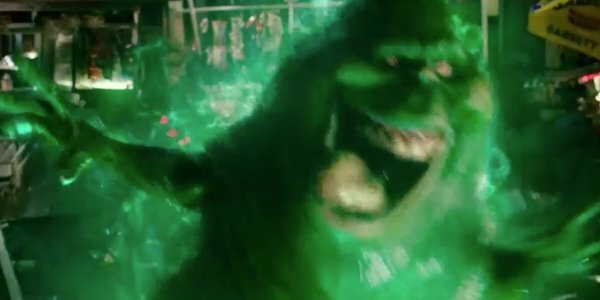 This first footage from Paul Feig’s reboot of the beloved horror-comedy franchise packs quite a bit into its limited runtime, and also gives us a solid baseline look at the new Ghostbusters played by Kristin Wiig, Melissa McCarthy, Kate McKinnon and Leslie Jones. Sure, there isn’t much available plot-wise… but do I have to remind you about Slimer? Based on a screenplay by Katie Dippold and Paul Feig, Ghostbusters begins centered on Erin Gilbert (Kristen Wiig), a college professor living in New York who gets laughed out of her position when a book she wrote about the paranormal finds itself in the hands of her superiors. With few other choices available to her in life, she returns to the side of Abby Yates (Melissa McCarthy) – her former best friend and the co-writer of the book – who has teamed up with a strange inventor named Jillian Holtzmann (Kate McKinnon) to find and hunt ghosts. The last piece of the puzzle comes into place when MTA worker Patty Tolan (Leslie Jones) has a paranormal experience of her own in the subways tunnels, and joins the team as the New York mastermind. Together, they must face down evil and try to save the city. Exactly what kind of evil the Ghostbusters will be facing off against, however, sadly remains a mystery. Because this debut trailer spends so much time with the new characters, unfortunately there isn’t any chance to reveal the identity of the central antagonist. Perhaps the filmmakers and the folks at Sony are holding that back for the second trailer. What will be interesting to see from Ghostbusters going forward is the way that it’s able to emerge as its own thing. There’s a lot of great iconography featured in this footage – as listed above – but the only thing that will really make this movie stand out is the way that it differs from the original and brings something new to the table. Given Paul Feig’s track record, bringing us movies in the past few years like Bridesmaids and Spy (not to mention his credit as the creator of Freaks and Geeks), we have real faith that he and his talented ensemble cast will deliver. More great Ghostbusters stuff is coming your way soon courtesy of CinemaBlend, so stay tuned for that… and look for the film in theaters on July 15th!